So… even though I have a major in Journalism and I love writing, blogging has never been something easy for me. Maybe because I’m a pretty reserved person and really don’t like talking about myself. But I figured this time it wouldn’t be only about myself but more about my experiences in traveling and volunteering around the world. Yep, you heard it right! That’s my life now and I have to admit I’m brand new into it. Not the traveling part. That I have been doing all my life! And I can’t get enough! 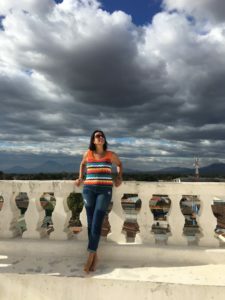 But offering my skills and abilities around the world to organizations that need that and, in exchange, learn a different culture, visit different countries and meet amazing people, that’s pretty knew. But I have to admit it: it’s pretty damn exciting! So let me start from the start. I was living my life in Belo Horizonte, Brazil. Working at a place that I loved, with amazing people, with an amazing staff. Had my little place, my car and could afford pretty much what I love: good food, concerts, going to the movies, restaurants, pubs, traveling, hanging out with friends… all of it! Until it wasn’t enough anymore and I started to feel that itch…. the one that makes you rethink your life and go: am I happy? Well, I wasn’t. Not completely, anyway. So I started to think about options. And the first one, of course, was thinking about living abroad. Because that was always option #1! So I started thinking about it, deciding where I wanted to go, talking to friends abroad, saving money. But the when was always an issue. I mean: it’s pretty hard to leave a job with a good salary at a place you love with people you really enjoy. And I had a pretty settled life. Not that I was extremely happy with it, but it sure weights on you and your decision. Until, of course, life (and the Universe) makes the decision for you. And it so happened that I was laid off from my job. And trust me, that’s not as scary as it may seem and it can come pretty handy. Because that move made me rush things really quick. And from that point, man, things started happening so fast…. Fast enough that in shorter than a month I had decided what to do: so I signed up for the Experteering program at Moving Worlds Institute, got selected and started planning my next step in life. Three months later and here I am in Nagarote, Nicaragua, a pretty amazing place where I’ll have the chance to offer my marketing and education expertise to a nonprofit called NicaPhoto. I’m doing what I love, in an awesome place and meeting a lot of amazing people. What I get from all that??? That when you start making plans and wishing for something, be careful… it actually happens! So you’d better relax and enjoy the changes. Learn and take advantage of them. Because there’s nothing more exciting and more fulfilling in life than actually live it! So, let’s live it up! 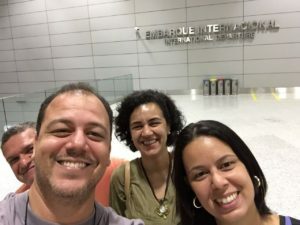 At Belo Horizonte airport with my brother, Ricardo, my sister, Luciana and my brother-in-law Eliano on my send-off to Nicarágua!